This is a re-post of a blog post that was originally posted on January 13, 2014. It has been slightly edited from the original: I have come out as transmasculine since this essay was first published and so I have changed my pronouns in the essay accordingly. I have also added a clarifying side note to make sure readers know that I do not believe any human being at all, ever, is a tragedy! I am a person who tries my hardest to give everyone the benefit of the doubt. I realize I have a strong streak of suspicion in me, so I aim for the best possible view of others and attempt to judge them innocent until proven guilty. Lately, the organization named Autism Speaks has worked really hard to provide me with that proof. Exhibit A: The “Call to Action” by Suzanne wright (the co-founder of Autism Speaks) that said that I and those like me are unspeakable horrors to our families who live in despair and depletion, ill and broken, because we are so awful to cope with. Exhibit B: the latest documentary film from Autism Speaks, titled, “Sounding the Alarm.” For an organization that tries to claim they are not alarmist, that is a pretty fishy film title, right? Those of you who have followed my blog for a while know that I was an incredibly difficult child to raise. I’ll be honest: I pretty much did deplete my mother (although she has bounced back quite beautifully these days.) And you know I’ve had a hard life, with bullying, abuse, poverty, homelessness, and chronic unemployment. But you know what else? 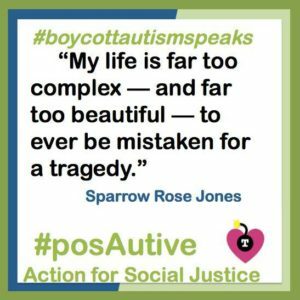 I would estimate that 90% of my difficulties in life were not caused by being born Autistic — they were caused by other people not coping well with who I am. People who don’t like the way I move, the way I speak, the things that catch my interest end up pushing me and bullying me and excluding me in ways that make my life miserable. Most of the “tragedy” of my life was completely avoidable if everyone around me had been encouraged to be a little more open-minded and discover the incredibly loyal friend or the hard-working and dedicated employee behind the quirky behavior and different way of viewing the world. You see, my life only becomes a tragedy when someone else chooses to frame it that way. And that is objectifying toward me and people like me and I will explain to you why I feel that way. Human beings — at least those living in industrial “Western” culture — have basically two ways to view lives. There are lives, plain and simple. These are what they are living, what their friends and family are living. Regular lives have ups and downs and long, welcome stretches of “boring” everyday stuff. There is no overarching framework because they aren’t stories; they are lives. Stories are the other way to view lives. We view imaginary lives that way all the time when we watch television and movies. We also frame certain people’s lives as stories when we write about real people in books or magazines. Stories do not have long stretches of everyday “boring” regularity, because stories are about heroes and villains — stories are drama and drama is shaped by our theatrical forms that box everything up as Comedy or Tragedy. You’ve seen the masks, right? The iconic symbol of the theater with one mask laughing in hilarity and the other weeping openly. This is how we frame stories and this is why people who want to box me up and objectify my life so often strip all the complexity out of my “story” and try to fit it into comedy (“look at that ridiculous ******! !”) or tragedy (“Poor thing, he’s so pitiful. It’s inspirational to me that he even gets up every morning and goes on living day after day!”) People who want my life to be a story and not just a life are required to objectify me and amputate most of my actual life to get the essence of me into that little box they need to put me in so they can make their point. Well, if they aren’t talking about me, they need to stop counting me in order to make their massive “tsunami” declarations of millions and millions of us who are struggling and suffering (unless you give lots of money to Autism Speaks, of course. That will somehow magically stop our suffering . . . . well, no, it won’t. So they need you to give them some more money. Don’t stop yet! There are still MILLIONS AND MILLIONS of Autistics out there! Tragedy! Alarm! Crisis! Pandemic! . . . keep that money coming.) If there are so many millions of us, then they *ARE* counting me and people like me so how dare they say I have no right to be distressed by their rhetoric about ME? Would you like to know how *I* read the story of my life? Sure, there are hard times. I struggle a lot. But I also accomplish and achieve a lot. I would like less struggle. I would like a LOT less struggle. But I would not like no struggle at all, because having something to push against adds to my strength. I want to have some challenges so that I can have some accomplishments. I want to have some difficulties so that I can have some growth. As Robert Browning said, “a man’s reach should exceed his grasp”. I would like my grasp to come a lot closer to my reach (wouldn’t we all?) but I want there to always be something just brushing my fingertips, tempting me to press on. I never want to fulfill all my dreams, unless I grow new dreams in the meantime. I want there to always be someplace new to go, something new to strive for. I would like those things to be new skills, new arts, new travels and people. Right now, some of those ungrasped things are more fundamental. Right now, some of those ungrasped things are unmet needs, not unlived dreams. There are hard times and things I would like to improve, but that doesn’t make my life a tragedy. If I had to define my life in one word, it would not be “tragedy.” It would be “joy.” I have an abundance of joy in my life. I have always had joy in my life, even during the hard times. I believe I could be left sitting in a garbage heap and manage to find something beautiful there. It is summer and I am walking. The brush is scrubby and dry and tiny black-and-white checkered lizards bake in the sun on flat rocks. Raptors wheel high in the sky, nearly invisible against the glare of the sun. The trail I’m on dips lower, into a grove of evergreens, and suddenly I am wrapped in the sound of scores of little birds, singing in the trees. A swarm of dragonflies seemingly materialize from nowhere and I stop walking, transfixed by the beauty of the sun glinting rainbow sparks from their diaphanous wings as they circle lazily around my head. I am tucked away in a dusty corner of the library, reading. What am I reading? It must be a comic book of some sort, because I read intently, then suddenly burst into laughter, nodding my head and shaking my hands with excitement and happiness. Then I go back to intently reading with furrowed brow before bursting again into childlike laughter. Curious to see what is causing such reactions in me, you draw nearer to discover that I am reading a collection of dozens of mathematical proofs of the Pythagorean theorem. That beautiful moment when all the pieces fall into place is so glorious and profound to me that I am helpless to do anything but laugh with delight when I get to that point in each mathematical proof. I have a new musical instrument and I am exploring the sounds it makes. I am comparing it to every other type of instrument I have played before — and there are many — to see how it is similar and how it is different. Within five minutes, I play my first simple song. Within five days, I am playing as if I have been working with that instrument for months. I do the same things with languages — writing letters and poetry in grammatically correct Swedish three hours after I opened the parcel containing a Swedish-English dictionary and began studying the sentence structure of the language. I do the same thing with anything that is based on patterns because I am a pattern thinker. I do not think in words. I do not think in pictures. I think in symbols and patterns. Any process or thing that succumbs naturally to pattern thinking is an easy delight for my pattern-seeking mind and heart. I am exhausted, so I lay down to listen to music and maybe sleep for a couple of hours. My cat gets excited to see me recline because I am creating his favorite place in the whole world — I am becoming his cat mattress. He runs to me and climbs on top and we adjust ourselves to find the spot of maximum comfort for both of us, the two of us so in tune with one another that words are unnecessary. We go beyond communication; we commune. I wrap my arms around him and bury my face in his kitten-soft fur and he purrs and wraps his paws around my head. We lay there together, two souls breathing as one, rejuvenating each other with the priceless love and trust that connects our gentle spirits. I am not a horror. I am not a destructive force. I am not a tsunami or an epidemic. I am a human being, living my complex, messy, sometimes boring, sometimes gloriously beautiful, everyday life. My life is not a tragedy. I am a human being and we are too complex to be reduced to such abject objects. See us . . . really see us. We are priceless beyond measure. We are not tragic. Please do not assist any person or organization in attempting to reduce our beautiful and complex lives to little more than a theatrical stage show. Our lives are not tragedies. This is a hard post to deal with. Actually, I find it hard to take on board. You write beautifully, as always, so it is me having the issue. I know, intellectually, that we are not tragics. I just don’t feel it in my soul. When I look into the mirror of life, my tragedy is writ large and in neon. It takes extraordinary amounts of energy to negate what others think, act out and display, and to find my own sense of being valid and not a tragedy. I commend you for being able to articulate your validity, and to feel, and know, it is so. I am not very self aware and I rely on others’ feedback to gauge how I affect and work within the world around me. It is so very hard to see crumbs of validity when the resounding feedback is that of being useless. You know all this too well. I guess we are on journeys and there will come a day when I feel valid too. Thank you, Sparrow. You *are* valid — very much so! I, too, hope a day comes when you feel it from the core of your being. So much of that feedback is noise coming from people who are judging you without really knowing you. I could easily paint my life as a tragedy by shifting my focus…homelessness, failed friendships and romances, abuse, repeated academic drop-out. Those things are part of my life but they are not defining. What I think of as me … truly me … is the curiosity and love I carry through life and offer to the world. If the world chooses to reject those gifts, it does not diminish my value. So, too, your value is not diminished by the thoughtless rejections from others that you cope with. You are a jewel, whether those around you are perceptive enough to observe your shining or not.